KANE GeoTech, Inc. and Dr. Kane have been designing, building, installing, and monitoring geotechnical instrumentation systems since 1994. These include complete Remote Monitoring Unit (RMU) for slopes capable of recording ground water levels, rates and directions of ground movement, locations of failure surfaces, rainfall quantities, and soil moisture. We offer a complete range of services that cover the full lifecycle of an instrumentation project, from initial requirements analysis and design through implementation and monitoring. Since 1994, KANE GeoTech, Inc. has been at the forefront of remote monitoring stations and geotechnical instrumentation. This experience allows KANE GeoTech, Inc. to design RMU’s combining geotechnical principles with expertise in remote sensing, electronics, and instrumentation. We have installed RMU systems to monitor landslides, rockfall, structure subsidence, levee stability, and performance monitoring of highway bridge abutment and MSE wall construction. Our systems can automatically send alerts to key personnel via text message or email, enabling decision-makers to act immediately to prevent costly damage to infrastructure or even loss of life. Alerts can be configured individually for multiple instruments, and with multiple alert thresholds for different levels of notification or action. 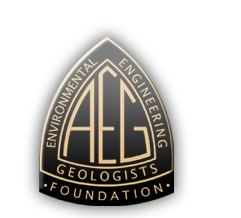 Dr. William Kane was instrumental in the application of Time Domain Reflectometry (TDR) techniques to slope stability monitoring, making KANE GeoTech, Inc. one of the few geotechnical engineering firms in the world with extensive experience in TDR technology. Our expertise includes full automation of remote TDR data collection systems, in addition to our TDR Field Reflectometer©, which offers rugged convenience for manual TDR data collection. Using our on-site web server, we supply our clients with near-real-time data viewable with any web-enabled device, including computers, tablets, and smartphones. Clients can view all their data, from moments to years ago, and configure graphs and data displays on demand. Graphical displays with site photos or drawings make it easy to rapidly understand trends and locate problems. Click here to interact with data from our on-site weather station hosted on our Web-Access Data server. 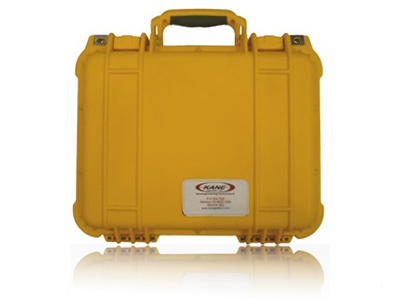 KANE GeoTech, Inc. also provides instrumentation systems on a rental basis. This arrangement is popular for projects that have a relatively short lifespan for their instrumentation needs. KANE GeoTech, Inc. has developed a lightweight field TDR unit built around the Campbell Scientific TDR100 reflectometer. 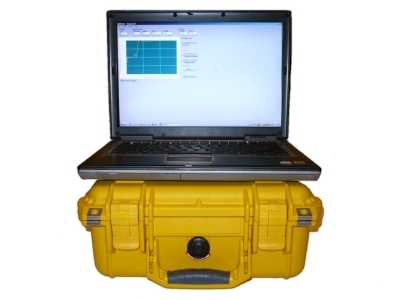 The unit features a TDR100 and rechargeable battery housed in a weather-proof case, with exterior-mounted ports. The TDR100 can be easily removed for use in a remote monitoring system. KANE GeoTech, Inc. is an experienced installer of Time Domain Reflectometry (TDR) systems for slope monitoring. We can tailor installations to the client’s preferences. Some clients prefer that we monitor their sites and report our findings. Others wish to have packages installed and be trained to do their own in-house monitoring. Packages are custom assemblies of electronic equipment from other suppliers. They can be purchased from KANE GeoTech, Inc. or are available for rental. Current practice for monitoring slopes uses surveying to track the movements of targets on the slope surface, extensometers which record the movement of a wire firmly attached to the slope, tiltmeters, or inclinometers. Inclinometers are the most common means for the long-term monitoring of slopes. Installing an inclinometer involves boring a hole into the embankment surface and casing it with a slotted PVC pipe. The casing is flexible enough to deform as the slope moves. Periodically, an inclinometer probe is lowered down the casing and retracted. The probe uses accelerometers to determine the direction of gravity and the stored data is used to depict the shape of the casing at the time of reading. Inclinometers have certain disadvantages. The chief one is that data recording is time-consuming. An operator must physically visit the site to record each inclinometer hole. The probe must be lowered to the bottom of each hole and time allowed to equalize the probe temperature with the ambient temperature in the hole. The operator must record data, usually by pushing a button, at each interval and pull the probe up to the next location to be read. Once the data has been collected, the probe must be turned 180º and the process repeated. This is done for every inclinometer hole on a particular site. Among the other drawbacks associated with using inclinometers are the relatively high cost of inclinometer casing and the limiting factor of hole depth. For very deep holes, the cable that supports the probe must be specially manufactured to prevent it from stretching under its own weight in the hole. In addition, the data must be plotted, usually off-site, before any movement can be determined. Time domain reflectometry (TDR) is a new approach to monitoring landslide and embankment stability. Originally developed to locate breaks and faults in communication and power lines, TDR can be used to monitor the movement of earth slopes. Data collection consists of simply attaching a TDR cable tester to a coaxial cable grouted in a borehole, and taking a reading. 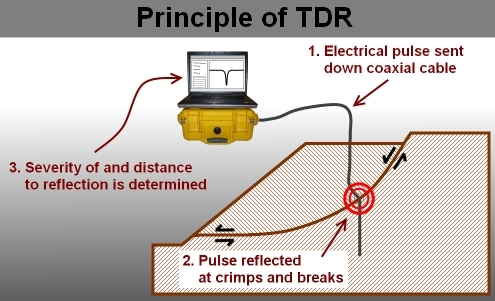 The basic principle of TDR is similar to that of radar as shown above. An electrical pulse is sent down the coaxial cable. When the pulse encounters a break or deformation in the cable, it is reflected. The reflection shows as a “spike” on the characteristic cable signature, as shown below. The relative magnitude and rate of displacement, and the location of the zone of deformation can be determined immediately and accurately. 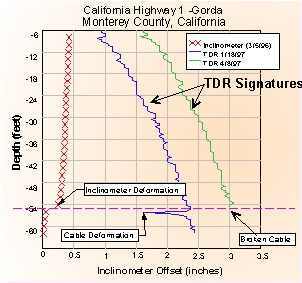 The figure below compares an inclinometer reading with TDR signatures from the same location. The size of the spike increase correlates with the magnitude of movement on the ground surface as shown by the inclinometer. Coaxial cable costs between 2 and 38 percent of inclinometer casing. Inclinometers are limited by the depth of the hole. Inclinometers in deep holes require special winches and cables due to the extreme weight of the equipment. All TDR monitoring equipment remains at the surface. Only an inexpensive, easily placed cable is grouted into the ground. It takes a few minutes to read any TDR cable regardless of its length (up to 1.5 km!). Inclinometers can be extremely time-consuming, especially for deep holes requiring many readings. We have installed TDR cables in holes as deep as 272 m. In some instances, all holes at a site can be accessed from a single location. KANE GeoTech, Inc. has installed TDR cables in angled boreholes, and isolated monitoring in deep zones below a moving upper zone. Neither installation could have been done with an inclinometer. TDR cables can be read at a distance from a moving slope or, if installed in a traffic lane, from safely behind a barrier. With TDR, the location of any movement is determined immediately at the site. It is usually not necessary to reduce the data using additional software. We have installed TDR monitoring systems in vehicular traffic lanes so that monitoring can continue without interrupting traffic flow. TDR can be installed with conventional drilling or even cone penetrometer (CPT) equipment. TDR is digital information. 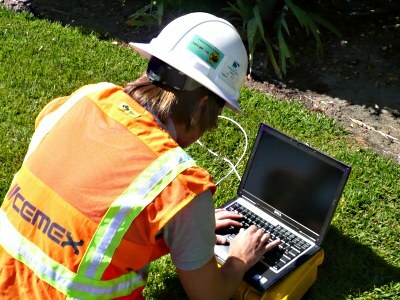 An on-site remote monitoring station can be installed for relatively little additional cost. Cellular phones, conventional phone lines, radios and satellite communications can be used to monitor any slope from anywhere on earth. It can easily be bundled with other instruments such as extensometers, inclinometers, rain gauges and piezometers.